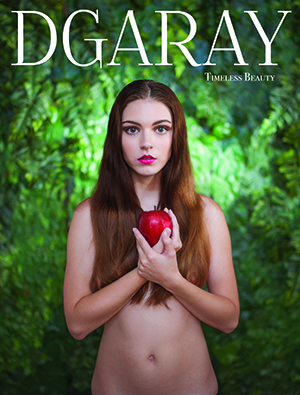 DGARAY Magazine is an oversized 11 x 14.5 publication with 140 pages of art, creativity, and inspiration. Founded on April 15th, 2015 by creative photograher Delmy Gooch to inspire the world. A creative alliance composed of music, fashion, model life, art, photography, cinematography, food, entrepreneurship, and empowering life stories to revolutionize our thinking and reassess our values in today’s social media and high-paced technological world. The mission is to provide a platform where creative professionals will be featured to inspire, empower, and grow into modern day role models that celebrate originality. Timeless Beauty Limited Edition is ready for purchase!! Pre-order your print copy and be the first 50 customers to receive an official Limited Edition Copy . The deadline to pre-order your Limited Edition will be May 28th, 2017. Prices may be subject to change & increase after the deadline. Magazines will be shipped 7 days after the May 28th deadline. DGEARLYBIRD | $4.00 off regular magazine price. DGNOSHIP | Colorado Residents bypass shipping fees if you rather pick up magazine in Denver. DGCOMBO | $4.00 off & no shipping fees. You must pick up copy! ← Vote for Timeless Beauty Cover!